On Tuesday, Tesla CEO Elon Musk expressed his desire to take the company private. But he said that, if Tesla does go private, it will not merge with SpaceX, Musk's space exploration company. The companies have worked together in the past, according to a Bloomberg report from September. And they will collaborate on an upgrade package for Tesla's upcoming Roadster sports car, which Musk has said will include around 10 small rocket thrusters that will improve the vehicle's acceleration, maximum speed, braking, and handling. 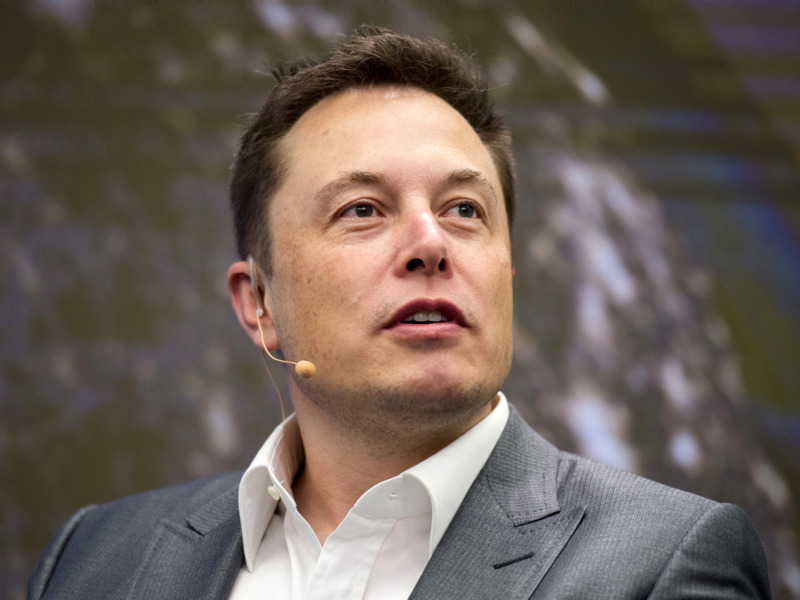 On Tuesday, Tesla CEO Elon Musk expressed his desire to take the company private. But he said that, if Tesla does go private, it will not merge with SpaceX, Musk's space exploration company. "The intention is not to merge SpaceX and Tesla. They would continue to have separate ownership and governance structures," he said in an email to Tesla employees. But Musk did use SpaceX as an example of the benefits of going private, saying it is "far more operationally efficient" than Tesla. In contrast, Musk said, Tesla's status as a public company creates distractions that promote short-term thinking, which may not produce the best decisions in the long-term. As with SpaceX, Musk said Tesla shareholders will be able to buy or sell stock in the company around once every six months if it goes private. While Tesla and SpaceX won't merge, the companies have worked together in the past, according to a Bloomberg report from September. The publication cited an instance where SpaceX employees advised Tesla employees on how to identify a problem on an aluminum auto part. A Tesla representative told the publication that SpaceX and Tesla "are occasionally able to share ideas that help the other." The companies will also collaborate on an upgrade package for Tesla's upcoming Roadster sports car, which Musk has said will include around 10 small rocket thrusters that will improve the vehicle's acceleration, maximum speed, braking, and handling. Musk also said the package would remove the vehicle's rear seats and advised that it would not be suited for urban areas. You can read the full email Musk sent to Tesla employees on Tuesday below. Earlier today, I announced that I'm considering taking Tesla private at a price of $420/share. I wanted to let you know my rationale for this, and why I think this is the best path forward. I fundamentally believe that we are at our best when everyone is focused on executing, when we can remain focused on our long-term mission, and when there are not perverse incentives for people to try to harm what we're all trying to achieve. Here's what I envision being private would mean for all shareholders, including all of our employees. Finally, this has nothing to do with accumulating control for myself. I own about 20% of the company now, and I don't envision that being substantially different after any deal is completed. Basically, I'm trying to accomplish an outcome where Tesla can operate at its best, free from as much distraction and short-term thinking as possible, and where there is as little change for all of our investors, including all of our employees, as possible. This proposal to go private would ultimately be finalized through a vote of our shareholders. If the process ends the way I expect it will, a private Tesla would ultimately be an enormous opportunity for all of us. Either way, the future is very bright and we'll keep fighting to achieve our mission. 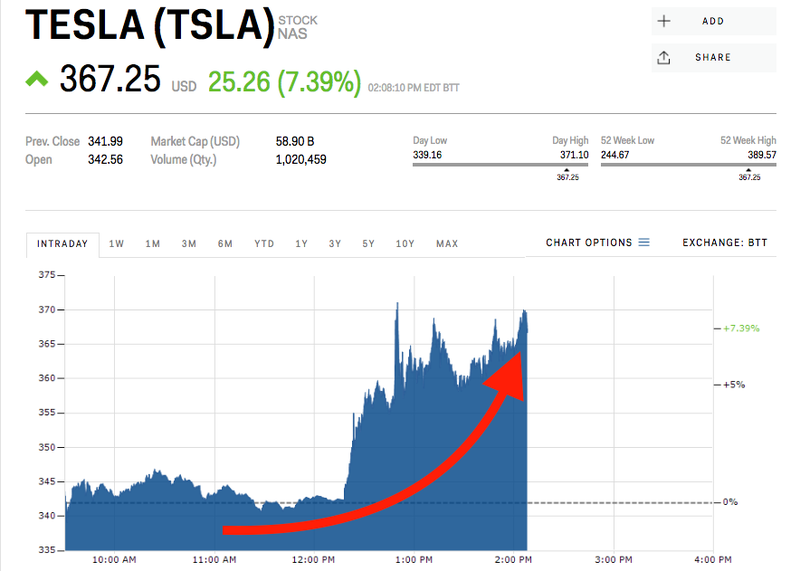 Elon Musk sent Tesla shares soaring on Tuesday after tweeting that he was considering taking the company private in a $420-per-share deal and had "funding secured." The tweet vaults Tesla into uncharted territory, as a CEO has never conveyed such sensitive corporate information in such an unconventional and casual manner. It also raises some legal red flags, especially if any part of Musk's tweet is found to be untrue, according to a legal expert interviewed by Business Insider. 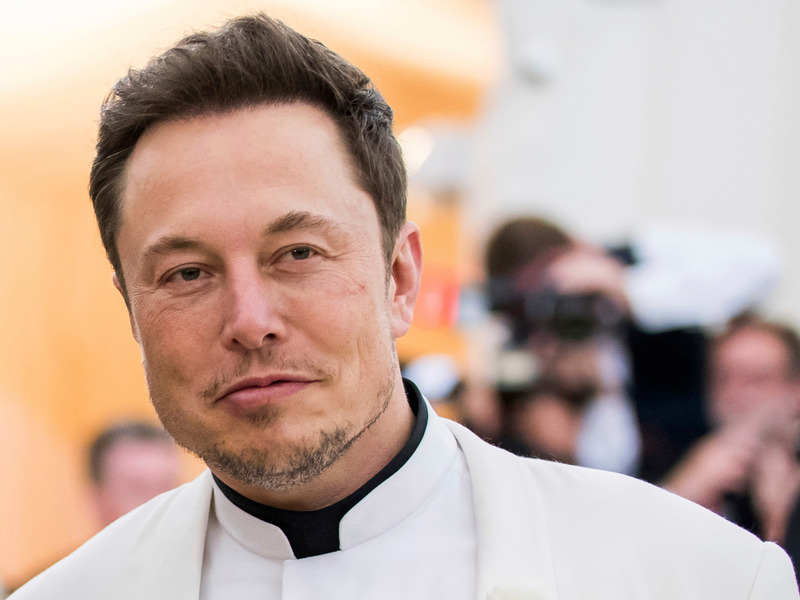 Elon Musk's quest to become the most unorthodox CEO of all time took another strange turn on Tuesday. The Tesla chief took to Twitter about 1 p.m. ET, telling his 22.3 million followers that he had a funding in place to take his company private at $420 — a roughly 20% premium to the stock's Monday closing price. Not only was he specific on the price, but he also said funding was "fully secured." 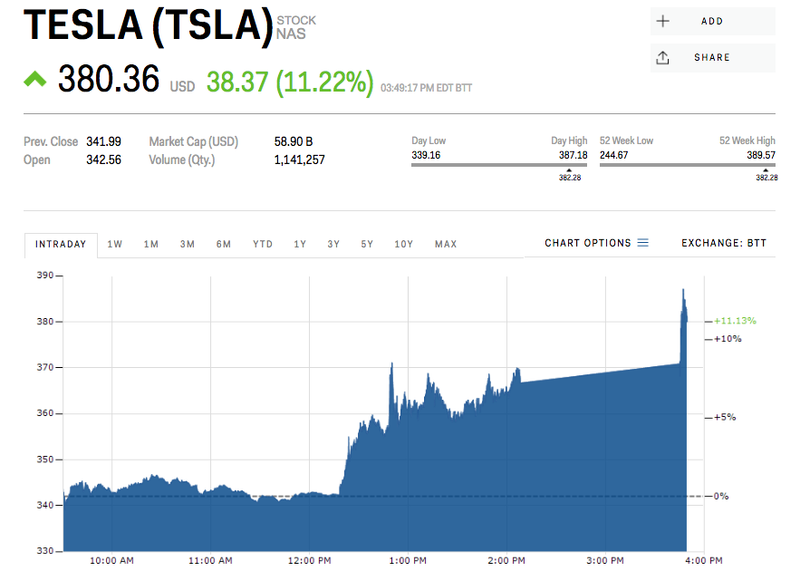 Tesla's stock immediately hit intraday highs, spiking more than 8% for the session before trading was halted about 2 p.m. ET. The shares resumed trading around 3:45 p.m. ET and quickly set another new daily high, climbing as much as 13%. The stock closed at $379.57, up from $344 where it started the day. In the end, Tesla added roughly $7 billion in market value on the day. 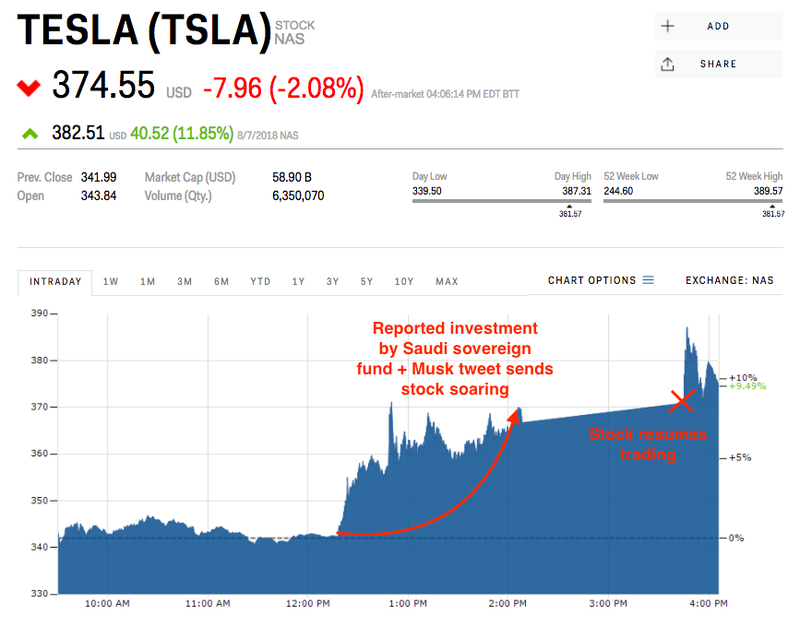 The stock also received a boost shortly before Musk's tweet on reports Saudi Arabia's sovereign wealth fund acquired a $2 billion stake in the company. With Musk's tweet, Tesla was plunged into unprecedented market territory. Never before has the CEO of a company so massive and widely followed disclosed something so sensitive on a social-media platform like Twitter. "Typically you'd halt the stock to make an announcement like this," Greg Sichenzia, a lawyer who advises companies on securities law, told Business Insider by phone. "I know he gets legal advice, but it’s unclear whether he sought it before tweeting." 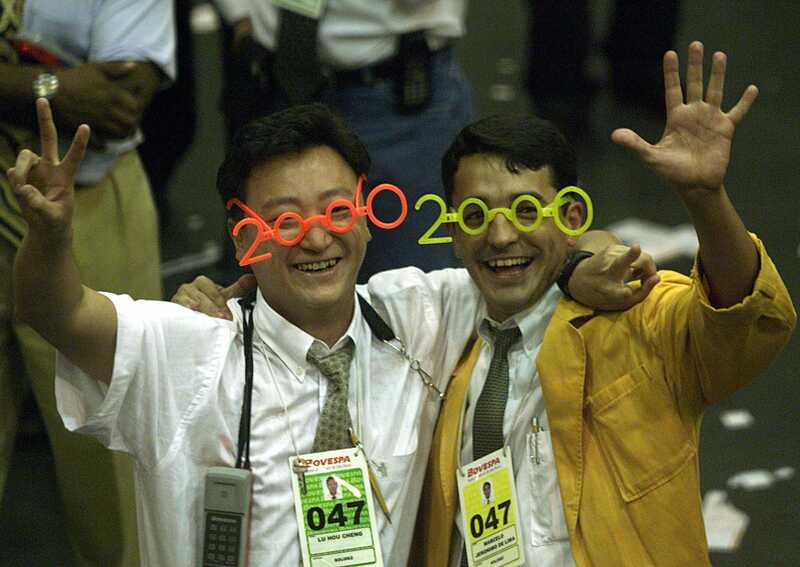 And as speculative investor fervor raged, so did cries of market manipulation. Armchair Twitter pundits in particular frothed at the mouth. How could Musk flout convention so flagrantly? "When you announce the price, it certainly smells like market manipulation," he added. "If any part of it isn't true, he could certainly be facing legal liability. It’s surprising that the CEO of a company would announce news like that." Harvey Pitt, who formerly served as chairman of the Securities and Exchange Commission (SEC), made similar comments during an interview on CNBC. In his mind, whether Musk did something illegal comes down to the CEO's motive in the manner. "If his comments were issued for the purpose of moving the price of the stock, that could be manipulation, and it could also be securities fraud," Pitt said. 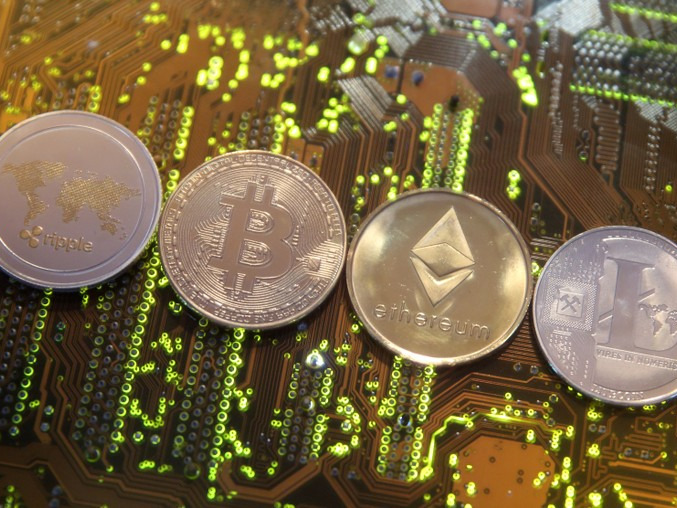 "The use of a specific price for a potential going-private transaction is highly unprecedented, and therefore raises significant questions about what his intent was. So that would have to be investigated." Sichenzia says there could very well be an SEC investigation into the veracity of Musk's market-moving tweet. He says Musk should be particularly worried about a violation of Rule 10b-5 under the Securities Exchange Act of 1934, which deals with the release of misleading statements. Perhaps the most damning part of Musk's tweet, as it pertains to Rule 10b-5, is once again its specificity, Sichenzia said. Even if it comes out that Musk had a fully funded deal in place at $400 per share, rather than $420, that could still be construed as materially misleading information. Musk could also be facing a bevy of private legal challenges, Sichenzia said. He said it is an entirely realistic scenario if Tesla's stock drops suddenly in the upcoming days. "If people are buying, buying, buying on the hype, and the stock crashes back to earth, perhaps below where it was, that could be problematic for him," said Sichenzia. "If the stock is down big, there could be private claims — some sort of class action." Musk sent an email to all Tesla employees following his tweet, which the company then posted on its blog, outlining a possible go-private scenario and his reasons for considering it. He said "a final decision has not yet been made" on going private, but that "the reason for doing this is all about creating the environment for Tesla to operate best." "As a public company, we are subject to wild swings in our stock price that can be a major distraction for everyone working at Tesla, all of whom are shareholders," he added. Immediately after Musk's initial tweet about taking Tesla private, cynics on Twitter wondered aloud: Is this just the CEO's latest strike in his months-long battle against short sellers? If so, the ensuing stock surge was a victory of sorts for Musk. The 8% increase likely cost short sellers hundreds of millions, squeezing their positions like a vice. After all, Tesla is the most shorted company in the US market by a margin of billions — and such large, extended positions have huge downside. "As the most shorted stock in the history of the stock market, being public means that there are large numbers of people who have the incentive to attack the company." In the event that Tesla does get taken private at the $420-per-share price floated by Musk, Tesla bears will incur a $4.4 billion loss on the positions they've built throughout 2018, according to financial technology and analytics firm S3 Partners. To fully understand what a victory this is for Musk, one must be familiar with his ongoing crusade — which he usually wages on Twitter. "If you're short, I suggest tiptoeing quietly to the exit … " he taunted in May, following Tesla's previous earnings report. In a Rolling Stone profile last year, he called them "jerks who want us to die," while also describing their behavior as "hurtful." He also fired off a tweet in June 2017 in which he said short sellers "want us to die so bad they can taste it ." Then, in early April this year, after a period of considerable stock strength, Musk escalated his taunts, tweeting, "Stormy weather in Shortville." In the end, whether Musk's tweet was a ploy to crush short sellers, an attempt to manipulate Tesla's stock, or a completely legitimate — albeit unconventional — corporate announcement, one thing is certain: The CEO never fails to entertain. 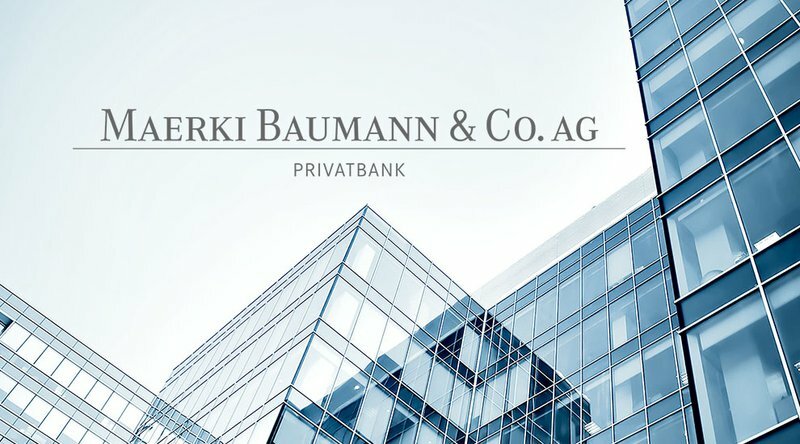 Maerki Baumann — a private bank based in Zurich, Switzerland — has announced it will manage its clients’ cryptocurrency assets. This makes it the second Swiss bank to make such an announcement following Hypothekarbank Lenzburg (Hypi), which stated in June that it would open business accounts for cryptocurrency companies. The bank recently published an article on its website entitled, “Cryptocurrencies — What Exactly Are They?” Written by the company’s deputy head of IT and digitization Milko G. Hensel, the article offers a brief description of some of the world’s best-known and most established digital currencies, such as bitcoin and ether. It then explains that, while the bank is prepared to “accept funds generated through cryptocurrencies,” it does not condone investing in cryptocurrencies given their volatility and speculative natures. First established in 1932, Maerki Baumann is a family-owned bank that has primarily offered asset management and investment advice for institutional clients. At press time, it supervises about $649 million USD in client holdings. The bank openly admits that its knowledge of cryptocurrencies is limited, though it will provide “experts” to investors looking to take advantage of its new services. In addition, it is also advising clients to consult with Bitcoin Suisse — a digital currency firm — for further information. “Maerki Baumann closely monitors the development of these investment vehicles and the underlying regulation without our commitment to engage in this arena,” the bank says in a statement. Switzerland is becoming a global hub for cryptocurrency and blockchain-related projects. SIX Group — the parent company of Maerki Baumann — announced last July that it will be launching a fully integrated digital asset infrastructure. Known as the “Swiss Digital Exchange,” the venture is set to open its doors early next year under the guidance and supervision of the country’s national financial regulator. Furthermore, the country’s wealthy town of Zug has been dubbed “Crypto Valley” — a take on northern California’s esteemed “Silicon Valley” — due to the 200 to 300 individual cryptocurrency businesses it currently plays host to. Stocks rose Tuesday, with the S&P 500 approaching its January peak, as Tesla rallied more than 9.5%. The dollar fell, and Treasury yields jumped. Tesla trading was temporarily halted after a tweet from the account of CEO Elon Musk suggested he is considering taking the company private. "Am considering taking Tesla private at $420. Funding secured," Musk said on Twitter just after noon. Earlier Tuesday, the Financial Times reported Saudi Arabia's sovereign wealth fund had accumulated about a $2 billion stake in the electric-car maker. Tesla neared an all-time high when its resumed trading. In the latest sign of a robust labor market, job openings in the US held close to record highs in June. The job openings rate stayed at 4.3 percent that month, the Labor Department said, with an additional 20,000 jobs in the education sector and a decline of 84,000 jobs in other industries. South Korea said it would block a trade agreement with the US if its cars aren't exempt from President Donald Trump's proposed tariffs. The move would jeopardize one of the only deals the president has successfully negotiated since starting a protectionist crackdown. Earnings season rolls on. Snap, Walt Disney and Papa John's report after the bell — follow Business Insider for live updates. Annual inflation numbers are out in China. The US reports crude oil inventories. IBM, Microsoft and General Electric post earnings later this week. American troops serving overseas will be able to cast their votes in West Virginia through a mobile voting platform based on blockchain technology in the federal elections in November 2018. The mobile voting platform, Voatz, will use facial recognition software to match each user’s “selfie-style video of their face” to their government-issued ID, according to a CNN report. Once approved, voters will be allowed to cast their ballot on the app. Ballots will then be anonymized and recorded on the blockchain. Voatz is a Boston-based startup that combines internet-based voting with blockchain technology. The platform was created to encourage citizen engagement and tackle low participation in local elections. West Virginia Secretary of State Mac Warner commented, "There is nobody that deserves the right to vote any more than the guys that are out there, and the women that are out there, putting their lives on the line for us." Warner also clarified some misconception that the app was going to replace traditional balloting, by saying it was an option and troops can still "cast paper ballots if they like." 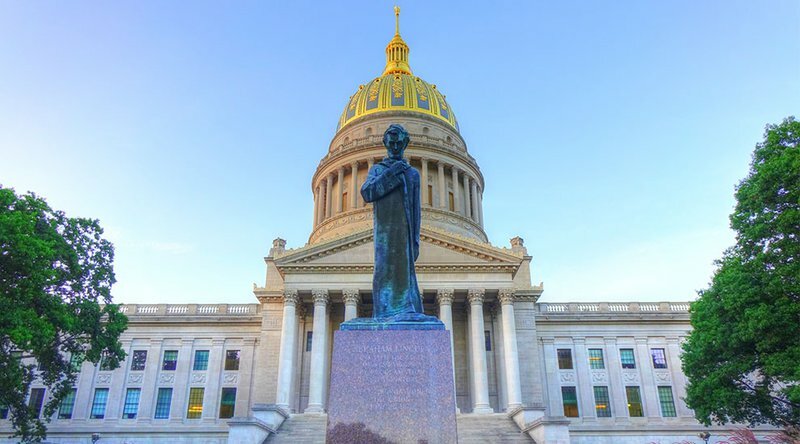 Earlier this year, state officials ran a pilot of the Voatz mobile app for deployed troops and their dependents in Harrison and Monongalia counties and found the results to be satisfactory. Warner's office also claimed in the report that “four audits of various components of the tool, including its cloud and blockchain infrastructure, revealed no problems." In a previous interview with Bitcoin Magazine, Voatz co-founder and CEO Nimit Sawhney said that Voatz has been working to connect disenfranchised citizens and ensuring that the platform remains accessible to all, regardless of geography or socioeconomic status. “Aside from major government-issued IDs such as driver’s licenses, state IDs or passports, Voatz has experience using the 10 different kinds of official documents for the purposes of verifying a voter’s identity,” said Sawhney. "There is something to be said sometimes for small-scale pilots where we can learn the trade-offs," he remarked. While enthusiasm has been building around using the blockchain for voting in the state, a couple of experts seem to oppose the idea. Joseph Lorenzo Hall, the chief technologist at the Center for Democracy and Technology, believes "mobile voting is a horrific idea," while Mark Schneider, president of Verified Voting, said "no" when asked if he thought mobile voting was a great idea. Schneider believes a mobile app creates more opportunity for hacking and meddling. Michael L. Queen, Warner's deputy chief of staff, told CNN that officials would allow each county to decide whether they will use the app in the upcoming elections. Hitesh Mittal, the former trading head who recently sued broker ITG, is looking to make a big comeback with a new trading technology company. Mittal plans to launch the new firm in the next few weeks, he told Business Insider. The company is aiming to replace brokers in a key area: execution. Hitesh Mittal, the former hedge fund trading head who recently sued broker ITG, is looking to make a big comeback with a new trading technology company he's been working on for the past year. Mittal claimed in a suit that ITG made him out to be a crook, which caused him to be fired from a new job at top quant shop AQR Capital Management. In 2015, ITG paid more than $20 million in a settlement to the Securities and Exchange Commission. The regulator accused ITG of betting against clients, despite having said it would not do so, in a pilot program known as "Project Omega." Mittal accuses ITG of placing blame of the project onto him which resulted in his subsequent termination from AQR. Now, Business Insider has learned that Mittal has been working on his own firm since August 2017. 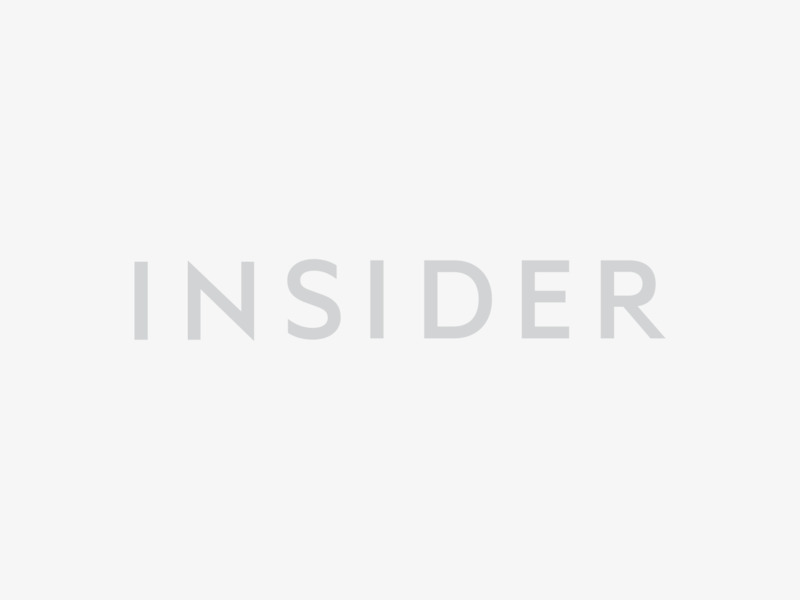 Mittal told Business Insider in an interview that his firm, BestEx Research Group, is preparing to launch its first product in the coming weeks. The company would replace brokers — like his former employee ITG — in a key area: execution. Typically, when a money manger is looking to get a trade done they go to a broker. Then, that broker uses its technology to figure out how that trade will get best executed. Mittal's plan is to provide algos to investment firms — such as hedge funds and other asset managers — which they can use instead of the technology provided by a broker. The broker would just be responsible for routing the trade to an exchange. He says that the company's goal is to lower costs for asset managers because they don't have to spend time and money building those algorithms in-house. Tesla's stock neared an all-time high of $389.61 Tueday after the company announced plans to go private. The stock was halted for roughly 90 minutes before the news was announced. CEO Elon Musk bemoaned the pains of being public, like quarterly earnings reports, in a blog post. Shares originally surged 7% in trading following a tweet from Musk hinting at the plans. After trading resumed, they climbed more than 11%. Shares of Tesla surged by as much as 12% on Tuesday, nearing a new record high of $389.61, after the company said it will attempt to go private pending a shareholder vote. The stock was halted for roughly 90 minutes following a 7% surge in the stock's price earlier Tuesday after CEO Elon Musk hinted at the possibility of going private on twitter. "A final decision has not yet been made, but the reason for doing this is all about creating the environment for Tesla to operate best," CEO Elon Musk wrote in a company-wide email published on Tesla's blog. "As a public company, we are subject to wild swings in our stock price that can be a major distraction for everyone working at Tesla, all of whom are shareholders. Being public also subjects us to the quarterly earnings cycle that puts enormous pressure on Tesla to make decisions that may be right for a given quarter, but not necessarily right for the long-term." Tuesday's flurry of news surrounding the electric automaker began with a Financial Times report that Saudi Arabia's Public Investment Fund, which controls more than $250 billion in assets from decades of oil exports, had amassed a stake representing three and five percent of Tesla's outstanding stock worth between $1.7 billion and $2.9 billion, based on on current prices. Tesla's stock price rose about 3% following that report. Just minutes later, Musk tweeted that he was "considering taking Tesla private at $420," adding that finding was "secured." Shares were halted at 2:08pm for the official announcement, which came around 3:30 pm. The stock resumed trading at 3:45 pm, just before the close of markets, and rose as high as 10%. Tesla's previous record was $385, set in September 2017. The U.S. SEC has delayed a decision on a proposed bitcoin ETF, pushing its final determination ahead by more than a month. Elon Musk announced his intent to take Tesla private on Tuesday in a statement on the company's website. No final decision has been made yet and the proposal to go private would be contingent upon a shareholder vote. "This proposal to go private would ultimately be finalized through a vote of our shareholders. If the process ends the way I expect it will, a private Tesla would ultimately be an enormous opportunity for all of us. Either way, the future is very bright and we’ll keep fighting to achieve our mission," Musk said in the statement. Musk also said on Tuesday via Twitter that he will create a "special purpose fund" if the company goes private so current Tesla shareholders can keep their investments in the company. Tesla CEO Elon Musk announced he wants to take Tesla private on Tuesday in a statement. Musk said via Twitter after Tesla posted the statement that he has investor support, but that the decision is not final because it is contingent on a shareholder vote. 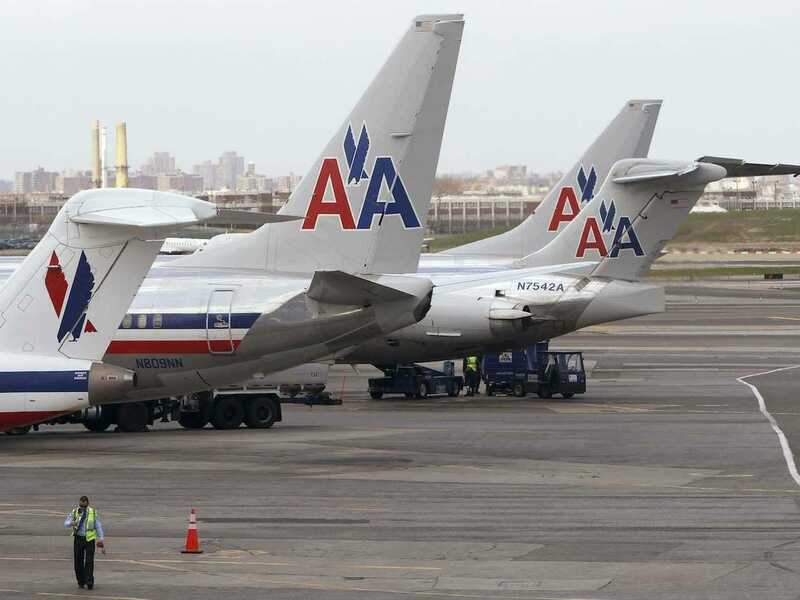 A dead fetus was discovered by a cleaning crew in the bathroom of an American Airlines commercial plane on Tuesday, after the plane had landed at New York's LaGuardia Airport on Monday evening. "As we continue to learn more about this tragic and sensitive situation, we are actively cooperating with law enforcement in its investigation," a spokesperson for American Airlines said in a statement. The Queens district attorney's office is investigating the incident. According to NBC 4 New York, American Airlines Flight 1942 left Charlotte, North Carolina, at 8:56 p.m. and landed at LaGuardia's Terminal B at 10:44 p.m. on Monday night. After passengers had deplaned, the plane, an Airbus 321, was placed at Hanger 5 and went out of service. Law-enforcement sources told NBC that the discovery of the baby was made before 7 a.m. on Tuesday. The baby's body was reportedly found in the airplane's toilet. While there had been some initial confusion by other outlets as to the age of the dead baby, a spokesperson for American Airlines confirmed to Business Insider that the baby was a fetus. Police were immediately called to assist after the discovery was made. The city medical examiner was also called to the airport to investigate the incident. In a statement to Business Insider, American Airlines spokesperson Matt Miller said, "As we continue to learn more about this tragic and sensitive situation, we are actively cooperating with law enforcement in its investigation." The Port Authority deferred Business Insider's questions to the Queens District Attorney's Office, saying they are "handling the investigation." They did not immediately return Business Insider's request for comment. Tesla spiked more than 7% Tuesday after the Financial Times reported Saudi Arabia's investment fund had amassed a $2 billion stake in the company. 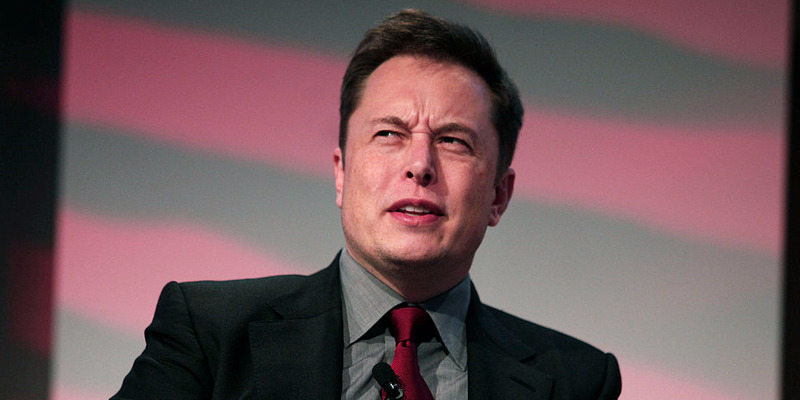 CEO Elon Musk tweeted shortly after that he was "considering taking Tesla private at $420." Tesla shares were halted at 2:08 pm for more news. Trading of Tesla's stock was halted at 2:08 pm Tuesday following a 7% surge after CEO Elon Musk tweeted that he was "considering taking Tesla private at $420," adding that finding was "secured." The unprecedented tweets came just minutes after the Financial Times reported Saudi Arabia's sovereign wealth fund had amassed a $2 billion stake in the company, which had initially catalyzed a roughly 3% jump in the stock price on Tuesday. Saudi Arabia's Public Investment Fund, which controls more than $250 billion in assets from decades of oil exports, now owns between three and five percent of Tesla's outstanding stock, the FT reported. The stake is likely worth between $1.7 billion and $2.9 billion, based on on current prices. The timing of the investment was not clear, but the FT said it likely happened during the Crown Prince Mohammed bin Salman's tour of the US in March. The paper also reported that Tesla rejected the fund's original offer to buy new shares in the company, and instead opted to buy them on secondary markets, with the help of JPMorgan. A Tesla spokesperson declined to comment on the investment. A separate request for comment on Musk's unprecedented tweet did not immediately receive a response. In a separate tweet, Musk said he "doesn't have a controlling vote now and wouldn’t expect any shareholder to have one if we go private." While the tweets aren't necessarily illegal — companies have been allowed to make material disclosures on social media since 2013 — they did raise questions across Wall Street. Speaking on CNBC, Harvey Pitt, former chairman of the Securities and Exchange Commission, said the tweets were "highly unprecedented" and that the move "raises significant questions about what his intent was." As a private company, Musk could avoid the short-sellers — or those investors betting against Tesla's stock price — that he has very publicly feuded with. Many Tesla bears — including Wall Street behemoths like Goldman Sachs — see a new capital raise, either through debt or equity offerings, as a real need in the near future. Musk maintains the company will be profitable this year, making any cash infusion unnecessary. "There’s a lot of noise that surrounds a public company and people are constantly commenting on the share price and value,” Musk told Bloomberg News in 2015. "Being public definitely increases the management overhead for any given enterprise." Shares of Tesla are up 15% since the beginning of the year. SEC officials huddled with stakeholders last week on a proposed bitcoin ETF. Big banks and software companies are among the most exposed to "key man" risk, according to a recent note from Morgan Stanley. Morgan Stanley looked at the risks of having a hugely important executive such as a CEO or chairman — dubbed a key man — suddenly step down. The bank found a rise in key-man turnover in recent years. Fifty-nine CEOs in the S&P 500 left their companies in 2017, and new data suggests an 11% increase year-on-year for key-man departures in the first half of 2018. PepsiCo CEO Indra Nooyi is the latest top executive to go, resigning Monday after 12 years in the role. Goldman Sachs is planning to move dozens of compliance jobs out of New York City as part of an ongoing plan to move back-office staff to lower cost locales. 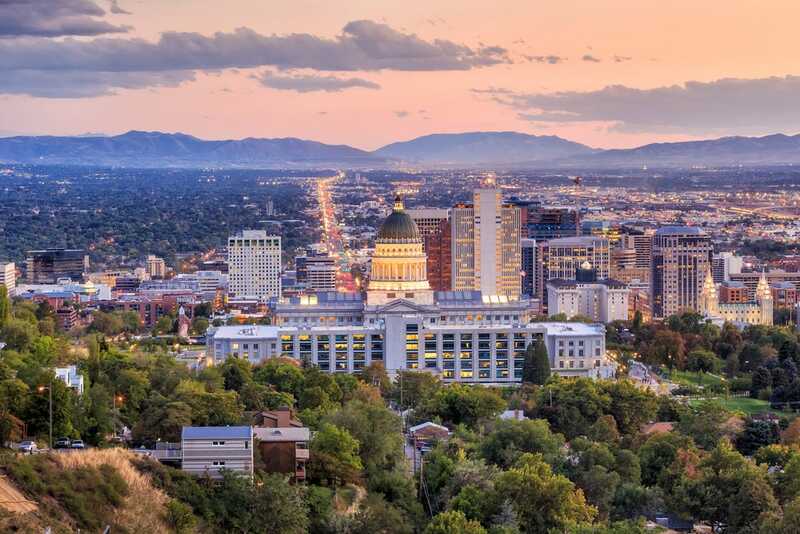 The investment bank has been moving staff to Salt Lake City for years and the proposed plans are another stage in that effort, according to people with knowledge of the matter. Affected employees may be told of their fate as soon as September, the people said. As the roles are shifted to Salt Lake City, New York-based employees will be given a chance to move or apply for other jobs in New York, one of the people said. Banks and asset management firms have been moving employees out of high-cost locations like New York and London for years to curb expenses and this shift has continued into 2018. Earlier this year, asset manager AllianceBernstein said it would send 1,000 jobs to Nashville. Deutsche Bank AG, which has had a hub in Jacksonville, Florida for years, is once again hiring for front-office staff in the southern city. Tesla CEO Elon Musk said on Tuesday via Twitter that he's considering taking Tesla private at $420 per share. "Am considering taking Tesla private at $420. Funding secured," he said . Tesla did not immediately confirm if Musk himself sent the tweet or if it was the result of a hack. The company did not immediately respond to a request for comment on the likelihood that it will go private, potential timing for doing so, or the funding sources Musk referred to. Tesla has been public since it filed an IPO in 2010. The company had a market capitalization of over $60 billion, as of Tuesday afternoon. 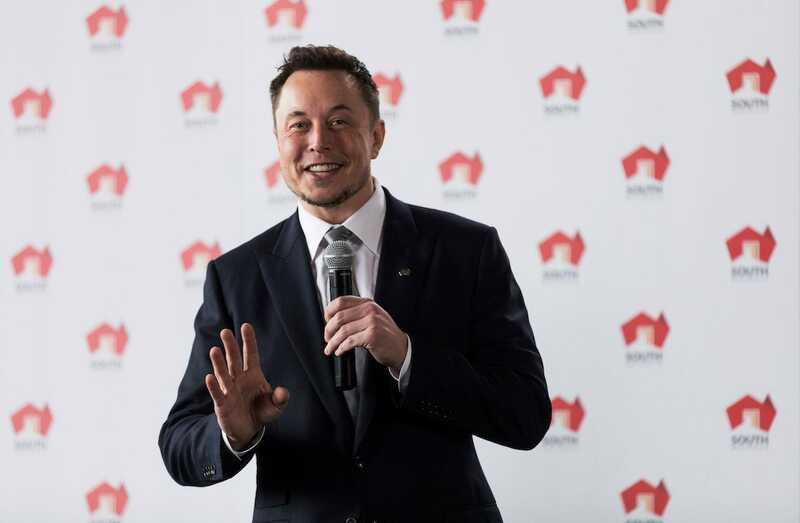 Its share price reached as high as $371.15 per share after Musk's tweet. It was trading around $361 in early afternoon trading. Carl Icahn doesn't want the health insurer Cigna's $67 billion deal with Express Scripts. Icahn, who recently took a stake in Cigna , wrote in a letter to Cigna shareholders Tuesday that the deal "may well rival the worst acquisitions in corporate history." Icahn disclosed that he was also short Express Scripts. Cigna, one of the US largest health insurers, announced the deal in March, offering $48.75 a share in cash for Express Scripts in a move aimed to cut soaring healthcare costs. The $54 billion price tag was a 31% premium to Express Scripts' stock price at the time and includes about $15 billion worth of Express Scripts' debt. Tesla CEO Elon Musk said on Tuesday via Twitter that he's considering taking the company private at $420 per share. Tesla shares were halted around 2 pm ET after Musk posted his tweet. "Am considering taking Tesla private at $420. Funding secured," he said. Tesla has been public since 2010. Tesla did not immediately confirm if Musk himself sent the tweet or if it was the result of a hack. Tesla CEO Elon Musk said on Tuesday via Twitter that he's considering taking the company private at $420 per share. Tesla halted trading shortly after Musk posted his tweet, news pending. "Am considering taking Tesla private at $420. Funding secured," Musk said. Musk also said he wouldn't expect to have a controlling vote if the company went private and won't sell Tesla stock. He added that he would remain CEO of the company. "I don’t have a controlling vote now & wouldn’t expect any shareholder to have one if we go private. I won’t be selling in either scenario," he said. "My hope is *all* current investors remain with Tesla even if we’re private. Would create special purpose fund enabling anyone to stay with Tesla. 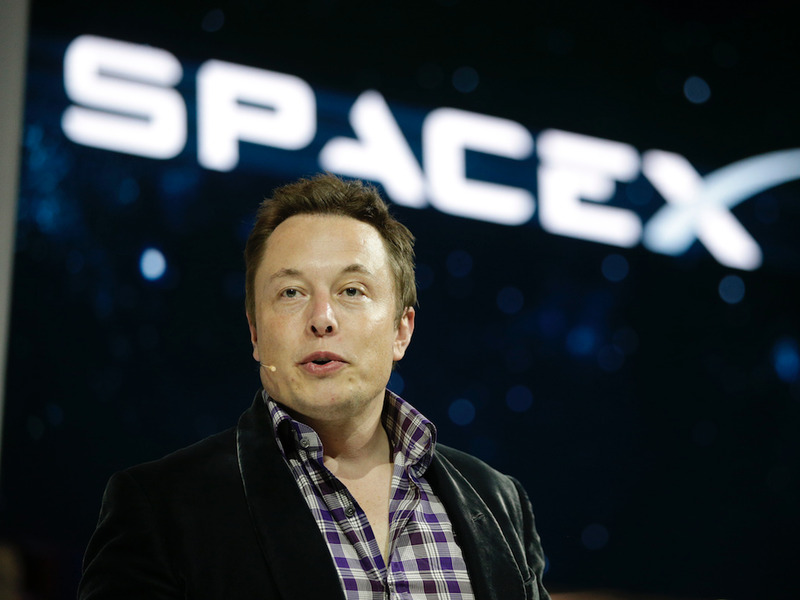 Already do this with Fidelity’s SpaceX investment," he said. Musk added that he was appreciative of the company's shareholders and "will ensure their prosperity in any scenario." Tesla has been public since 2010. The company had a market capitalization of more than $60 billion, as of Tuesday afternoon. Its share price reached as high as $371.15 per share after Musk's tweet. It was trading around $361 in early afternoon trading. Musk has said he would like to take Tesla private in the past. "I wish we could be private with Tesla," Musk said in an interview with Rolling Stone that was published in November 2017. "It actually makes us less efficient to be a public company." Musk has also said on multiple occasions that Tesla will become profitable by the end of this year and won't need to raise additional funds, despite its increased cash burn rate in recent quarters. At the end of June, Tesla achieved its goal of making 5,000 Model 3 sedans in one week. Musk previously said the company would hit that number by the end of 2017, and that sustaining such a production rate is critical for Tesla to become profitable. The Financial Times reported on Tuesday that Saudi Arabia's sovereign wealth fund has acquired a $2 billion stake in the company. The fund owns between 3% and 5% of Tesla's total stock, which means the stake is likely worth between $1.7 billion and $2.9 billion. Tesla reported an adjusted loss per share of $3.06 for the second quarter, which was larger than what analysts had predicted, and revenue of $4 billion, which beat analyst projections, in an earnings letter released last week. The company said it expects to be profitable during the second half of 2018. "Going forward, we believe Tesla can achieve sustained quarterly profits, absent a severe force majeure or economic downturn, while continuing to grow at a rapid pace," the company said in its earnings report. Snap Inc. is scheduled to report second-quarter earnings after the close of markets on Tuesday. The stock is down 45% since its IPO in March 2017, and Wall Street thinks it will keep sinking. 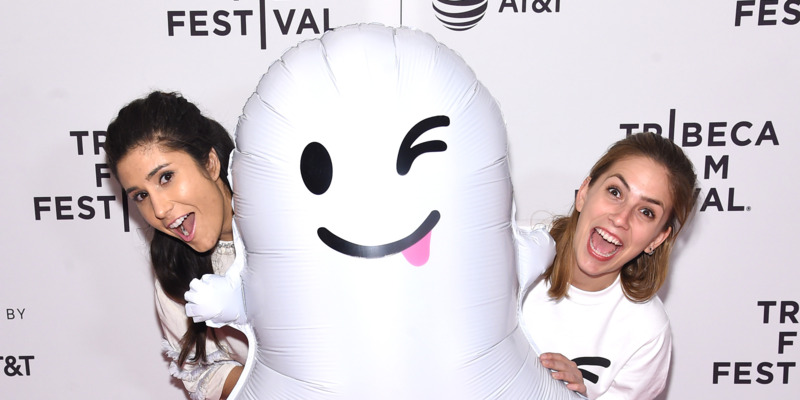 Follow Snap's stock price in real-time here. Shares of Snap were up more than 2% in trading Tuesday ahead of the social media company's second-quarter earnings report after the closing bell. Wall Street analysts expect the company to post an adjusted loss per share of $0.183 for the quarter ended June 30, on revenues of $249.82 million, according to Bloomberg. Public for a little over a year, Snap has fallen considerably off its highs of more than $20 in 2017. The Snapchat parent company now trades at around $13, or about 45% below its all-time closing high. Analysts polled by Bloomberg think it will continue to decline, and they give it an average price target of $11.66. "From a bigger-picture perspective, the primary area of concern from marketers and investors alike has been the lack of data Snapchat offers for targeting purposes," Mark Kelley, an analyst at Nomura Instinet, said in a recent note in July initiating coverage on Snap. "But we wonder if the new regulatory environment (GDPR, or General Data Protection Regulation), with its global spread inevitably limits the type, amount, and scale of data that companies are able to store and offer to marketers." Kelley has a $13 price target for Snap, and says he will remain on the sidelines for now until meaningful growth shows up in the financials. "If the fundamentals do improve, Snap should benefit from its exposure to the fastest growing subsegments of digital advertising—digital/social video—which likely approaches $80 billion globally in 2020 (total digital video, including Social)," he said. Shares of Snap are down 46% since its initial public offering in March 2017. 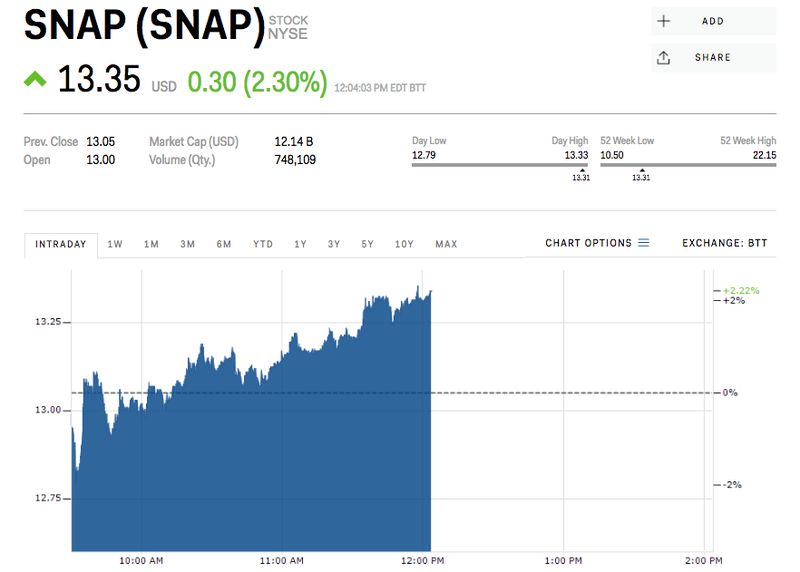 Check back here for Snap's full earnings report after 4 p.m. Tuesday. Financial technology firm Paxos has formed a partnership with INTL FCStone Inc’s precious metals division. The department will now be using Paxos Confirmation Service – a tool built specifically for the precious metals arena – to instantly automate daily trade confirmations and reduce human error. Using this blockchain-powered trust, Paxos seeks to unlock capital and create value with products that eliminate trade risk, while INTL FCStone provides market intelligence, post-trade services and financial services execution throughout the global financial market. The company boasts over 20,000 customers in approximately 130 different countries and is headquartered in New York City. Chad Cascarilla is the CEO and co-founder of Paxos. Speaking with Bitcoin Magazine, he says that the precious metals industry is prone to many of the same issues one finds with traditional banking institutions. Using the Paxos system, INTL FCStone can match trade economics within seconds, thus eliminating several manual tasks and improving operational precision. Trades are quickly captured, and if issues ever arise, they are quickly identified and resolved. Cascarilla believes Paxos’ technology will be developed to the point that it can be applied to virtually every financial space. He further states that Paxos will be phasing the rollout of the confirmation service to around 75 counterparty pairs in the coming months. JetBlue launched a two-day flash sale on Tuesday. The New York-based boutique airline is offering select one-way flights for as low as $34 from Worcester, Massachusetts, to New York. Other standout deals include $54 for flights between Atlanta and Boston as well as $44 to fly between Long Beach, California and San Francisco. All tickets must be booked by 11:59 pm on Wednesday, August 8. 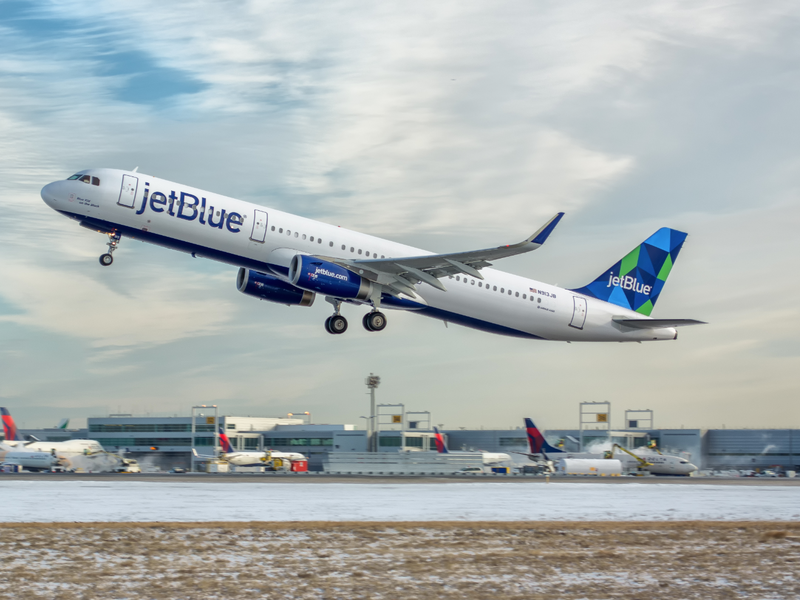 JetBlue launched a two-day flash sale on Tuesday with one-way tickets available for as little as $34 and round-trip fares as low as $73. The New York-based boutique carrier is calling the event its "Fall Runway Preview Sale." The cheapest fare in this sale is for flights between New York and Worcester, Massachusetts, about 40 miles west of Boston. One-way flights from Worcester to New York cost $34, while the flight back from the Big Apple is $39. JetBlue actually offered the same discount for this route back in May. Flights into and out of Atlanta are also heavily discounted, with Orlando flights priced at just $54 each way. An even better deal is a $108 round-trip between Atlanta and Boston. Round-trips between Fort Lauderdale, Florida and New Orleans can be for a very reasonable $128. On the West Coast, flights between San Francisco and Long Beach, California, are just $44 each way, while those from Long Beach to Salt Lake City are $10 more. As with every sale of this type, there are some preconditions. Flights must be booked by Wednesday, August 8 at 11:59 p.m. ET or your local time zone, whichever is earlier. The tickets must be for travel between September 4 and November 7. In addition, sale prices are not available for flights between September 10 and September 12 as well as on September 19 and on October 8. The prices featured in the sale are for the airline's Blue fare which allows for a free carry-on bag and a personal item. A checked bag will cost an additional $25. Goldman Sachs is planning to move dozens of compliance jobs out of New York City to Salt Lake City to cut costs, according to people briefed on the plans. Employees have not been told if they are affected, and an announcement could come as early as September, the people said. Separately, the bank is building up its compliance team for the consumer and commercial banking division in Richardson, Texas. A Goldman Sachs spokesman declined to comment. Banks and asset management firms have been moving employees out of high-cost locations like New York and London for years to curb expenses and this shift has continued into 2018. Earlier this year, asset manager AllianceBernstein said it would send 1,000 jobs to Nashville. Deutsche Bank AG, which has had a hub in Jacksonville, Florida for years, is once again hiring for front-office staff in the southern city, Bloomberg reported this week. Goldman's global compliance department is run by Sarah Smith, who was named to the role in March of last year. A 20-year veteran of Goldman, Smith has a background in accounting and audit and earlier worked at KPMG. The moves in her group are part of a long-running Goldman strategy. In 2012, then-Goldman president Gary Cohn highlighted the build out of offices in what the bank has dubbed "high value" locations. In a May presentation that year, Cohn said the strategy was so advanced that already 19% of the firm's headcount was based in lower-cost cities such as Salt Lake City, Dallas and Bengaluru. The make up is now much higher, climbing to 30% last year, according to a November 2017 presentation. The locations tend to cost 40-75% less than New York or other expensive cities like London, Tokyo or Hong Kong due to cost of living differences, Cohn said on those 2012 remarks. Separately, the bank is building up its Richardson, Texas office, about 15 miles north of Dallas. Many of the control and compliance functions for its digital bank, Marcus by Goldman Sachs, and related activities will be based there, one of the people said. In the past week, Goldman has been advertising for at least six such jobs in Texas, according to job postings compiled by Google. This story was delivered to Business Insider Intelligence "Payments Briefing" subscribers hours before appearing on Business Insider. To be the first to know, please click here. Two major retail players announced new initiatives this week designed to expand customers’ ability to pay with cryptocurrency. Starbucks and exchange operator Intercontinental Exchange are launching a platform to facilitate the use of digital currencies for common transactions. The platform, called Bakkt, will use Microsoft cloud solutions to allow users to convert Bitcoin to cash. Starbucks has not disclosed its specific role in the development, but the companies believe the new platform will be successful given Starbucks' success with its mobile wallet and loyalty program, Starbucks Rewards, which now counts over 15 million members. Though Bakkt doesn’t seem like it’ll enable direct cryptocurrency transactions, it could strengthen the relationship between Bitcoin and traditional retail. Coinbase is adding cryptocurrency acceptance capabilities for merchants using major e-commerce platform WooCommerce. Now, sellers using WooCommerce, which is estimated to be used by 28% of all online stores, can add a plug-in that will allow buyers to send money using Coinbase Commerce, the exchange’s current crypto payments platform, to the seller. This could provide Coinbase with a large addressable market in the digital currency space and expand crypto acceptance. These initiatives could help create a market for cryptocurrency payment solutions.Though the cryptocurrency market remains large, fluctuating value combined with inconsistent fees and high rates of transaction failure have led major payments companies, including PayPal and Stripe, to cease cryptocurrency acceptance. And it's becoming harder to buy cryptos since major banks, including Bank of America, Citi, JPMorgan Chase, and Wells Fargo, all prevent their customers from using credit cards to purchase cryptocurrencies. Demand for solutions remains tepid — just three of the top 500 e-tailers accept cryptocurrencies — but new offerings from wide-reaching players could change that, with broader availability piquing the interest of more users. In order to do so, the initiatives need to capitalize on the proven advantages of cryptocurrencies. Crypto-based payments have some safety advantages compared with payments companies' because they protect user data and could be faster, as they eliminate the need for middlemen. If these new offerings are popular among merchants, or stoke demand among consumers, we could see an uptick in crypto-based payments. That could help WooCommerce and Coinbase grab new merchant partners that are looking for an easy way to accept cryptocurrency. And if Bakkt can streamline the exchange of cryptocurrency to cash, especially if it's connected to retail payments, it could improve users’ customer experience or push them to explore paying with cryptos, which in turn could boost their usage as a payment method. NYSE owner Intercontinental Exchange (ICE), tech giant Microsoft, and Starbucks have partnered to launch a new company, dubbed Bakkt, that will look to develop an open, regulated, and global ecosystem for digital assets. The new venture will leverage Microsoft’s cloud solutions to enable consumers to buy, sell, store, and spend cryptocurrencies on a global network. Investors in Bakkt include ICE, Microsoft's VC arm M12, Galaxy Digital, Horizons Ventures, and Pantera Capital. Bakkt is in the process of obtaining regulatory approvals and will likely launch in November. Bakkt plans to roll out physical Bitcoin futures contracts. It wants to launch physical one-day Bitcoin futures contracts along with a warehouse, which are yet to be approved by the Commodity Futures Trading Commission (CFTC). When the contracts expire, customers will receive Bitcoin, as opposed to cash. This is fairly unusual — the futures offered by CME Group and Cboe are both settled in cash, for example. Starbucks wants to help make crypto transactions more usable. Starbucks is aiming to expand available payment options for its customers with this new venture. Specifically, it plans to enable consumers to convert their cryptocurrencies into US dollars to use for Starbucks purchases. Working with a large merchant like Starbucks may help to boost crypto adoption — but not for a while.Starbucks allowed customers in Hong Kong to pay for coffee using Bitcoin in 2015, and this new project is more evidence that it wants to make this payment option easier for customers. Additionally, converting cryptos into fiat money before a transaction will likely ensure that Starbucks doesn’t have to deal with the volatility of cryptocurrencies. 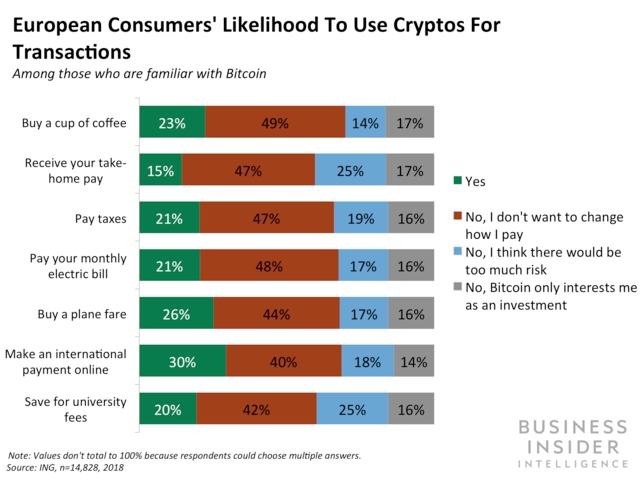 However, only 23% of customers would use cryptos for buying a cup of coffee, according to data from ING, which might make it difficult for Starbucks to get customers to adopt the new payment method initially. As such, while this could certainly encourage adoption, it will likely be some time before we see consumers using cryptos widely for everyday purchases, as that will require a broad change in mindset. US Secretary of Commerce Wilbur Ross has allegedly swindled associates out of more than $120 million, according to a new bombshell report from Forbes. The magazine interviewed 21 former colleagues, many of whom say he has a propensity to filch money for himself. The sum total of all the allegations against him come to $120 million, Forbes said. According to former colleagues, US Secretary of Wilbur Ross has been known to grab handfuls of Sweet'N Low on his way out of restaurants, to save himself the trouble of having to buy his own. But that may just be the tip of the iceberg when it comes to Ross' impropriety, according to a new bombshell report from Dan Alexander of Forbes. Forbes spoke to 21 people who know Ross, and found that many claim he wrongly took millions for himself on multiple occasions. The publication estimates that if all of these allegations are true, Ross has bilked associates out of more than $120 million. And Alexander pulled no punches in summarizing his findings, concluding: "If even half of the accusations are legitimate, the current United States secretary of commerce could rank among the biggest grifters in American history." A commerce department official called the allegations "petty nonsense," while a statement from Ross himself noted that "the SEC has never initiated any enforcement action against me." That's not entirely true, considering the SEC fined his firm $2.3 million in 2016. Beyond that, Ross argued that one lawsuit filed against him has been dismissed, failing to mention that it's still in the appeals process. Alexander's interest in Ross stemmed from the commerce secretary's apparent attempts to mislead Forbes, which the magazine says were an attempt to get himself higher on the publication's ranking of billionaires. Here's a breakdown of all the allegations outlined in the Forbes report, presented in chronological order. Adding together all of the bolded numbers, you arrive at roughly $120 million. 2005 — A former vice chairman of WL Ross filed a $20 million lawsuit against Ross, alleging the commerce secretary tried to cut him out of his share. They reached a confidential settlement, which reportedly cost $10 million. 2014-2015 — Invesco, the parent company of WL Ross, reported $43 million in regulatory and reimbursement expenses, which four former employees say were tied to issues that occurred under Ross. 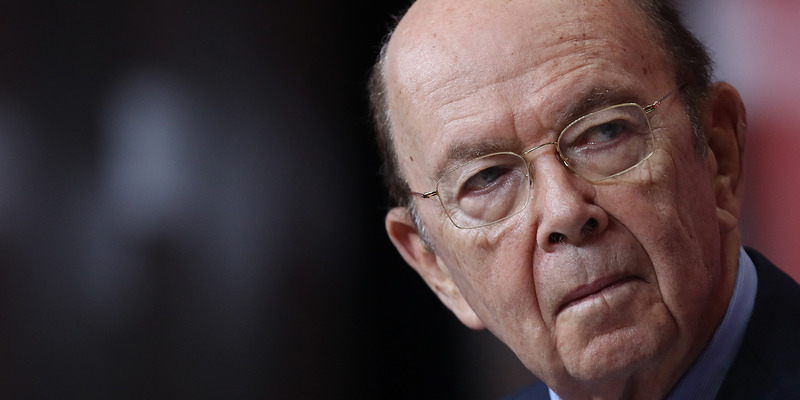 July 2015 — Ross' former number two filed a $4 million lawsuit, alleging the commerce secretary stole his interests. They recently reached a confidential settlement. August 2016 — As mentioned above, WL Ross agreed to pay the SEC $2.3 million after allegations that the firm defrauded an misled investors. The company settled without admitting wrongdoing. August 2016 — When the SEC announced its fine, it also revealed that the WL Ross paid back $11.9 million it allegedly took from investors, including interest, when Ross was running the firm. December 2016 — A former WL Ross employee sued the company, alleging that Ross "looted" his accounts to the tune of $3.6 million. November 2017 — Three former WL Ross executives sued Ross and their former firm, allegedly they charged $48 million in improper fees. Ross says the legal action is "without merit." Morgan Stanley analysed "key man" risk, looking at the damage that might be done if an influential CEO suddenly steps down. Asset managers, software companies, and large-cap banks have the highest risk, according to the study. The possible departure of JPMorgan CEO Jamie Dimon was highlighted as significant key man risk in the banking sector. Morgan Stanley looked at the risks of having a hugely important executive such as a CEO or chairman — dubbed a "key man" — suddenly step down. The bank found a rise in "key man" turnover in recent years. 59 CEOs in the S&P500 left their companies in 2017 and new data suggests an 11% increase year on year for "key man" departures in the first half of 2018. PepsiCo CEO Indra Nooyi is the latest top executive to go, resigning on Monday after 12 years in the role. Companies with "key man" losses in 2017 underperformed the rest of the market by an average of 11% over the following 12 months, with 32% of those companies underperforming the rest of the market by more than 20%, according to the research. "Key men" are defined as executives who: may be a company's founder, and therefore likely more integral to its value; are thought leaders in their industry; have key strategic knowledge and importance; or have a proven track record of value creation. Asset managers, software companies, and large-cap banks were found to be the sectors with the highest level of "key man" risk, due to a concentration of highly valued CEOs who are pivotal to their businesses. 25% of large-cap banks have a "key man" risk, according to Morgan Stanley's analysis. The most notable is JPMorgan. CEO Jamie Dimon was appointed in 2005 and has presided over a stock price increase of 193%, as well as steering the bank through the financial crisis. Dimon has achieved annual returns of more than 200bps above the S&P 500 during his tenure and has guided the bank to a greater scale and share value. He said in February 2018 that he plans to stay on as CEO and chairman for another five years. Morgan Stanley questions whether Dimon’s potential successors will be capable of generating the same leadership and results. "Successors are viewed to be co-Presidents Gordon Smith and Daniel Pinto, Head of Asset Management Mary Erdoes, and CFO Marianne Lake," Morgan Stanley's analysts write. 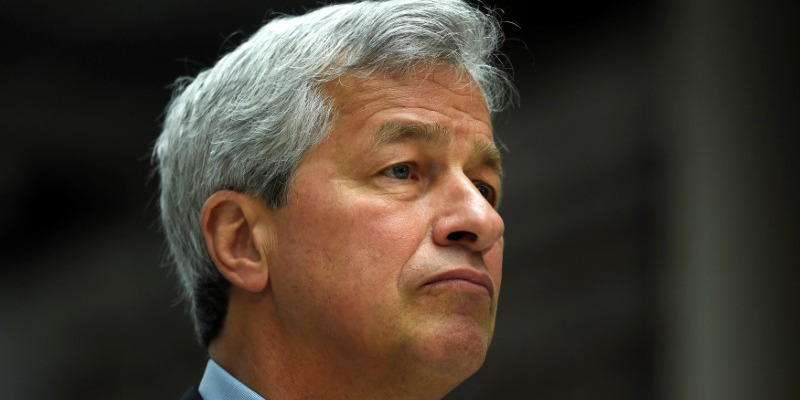 "Investor question is can these potential successors deliver the profitable growth that Dimon has executed across JPM’s unmatched breadth of product and geography." Other "key men" at major banks include Bank of America CEO Brian Moynihan, BB&T Corporation CEO Kelly King, Capital One CEO Richard Fairbank, and Moelis & Company CEO Ken Moelis. Morgan Stanley recommends investors become aware of the risks by asking questions about planned corporate succession, diversity of value held by senior leadership staff around the CEO, and learning more about the specific role a CEO plays in leading their company. Bitcoin solid defense of the key 50-day moving average support may have opened the doors for a minor corrective rally. Warren Buffett's Berkshire Hathaway had $111 billion of cash on its balance sheet at the end of last quarter, the most in the company's history. This is an ominous sign for the health of the market, and suggests that Berkshire Hathaway views it as overvalued and overly expensive. As merger and acquisition (M&A) activity has roared, Warren Buffett and his investing colleagues at Berkshire Hathaway have stayed on the sidelines. That means they missed out on an M&A bonanza that saw a record-breaking $2 trillion in deals through mid-May. But it also means Berkshire Hathaway has set a record of its own: It now has the biggest cash balance in the firm's storied history. While that can be construed as good news for Buffett & Co. — since they have a veritable war chest of capital ready for deployment — it carries far starker implications for the overall market. That's because Berkshire Hathaway's reluctance to buy anything can be viewed as a signal that just about everything is too expensive. And considering Buffett is one of the most successful investors in history, his market behavior should watched closely. With that said, it's not exactly breaking news that Buffett thinks few bargains exist. He said as much in his annual letter back in February, saying that the lack of attractive pricing "proved a barrier to virtually all deals we reviewed in 2017." What's more notable is that Buffett has stood pat since then as stocks have continued their grind higher. Valuations have only gotten more stretched over that period, suggesting that an already tenuous situation has worsened. Russ Mould, investment director at AJ Bell, has taken notice. He's wary of the speculative deal fervor he sees accompanying record stock prices. "M&A tends to peak when animal spirits are running high and often when executives feel their own shares are expensive enough to make them a valuable acquisition currency," Russ Mould, investment director at AJ Bell, wrote in a client note. 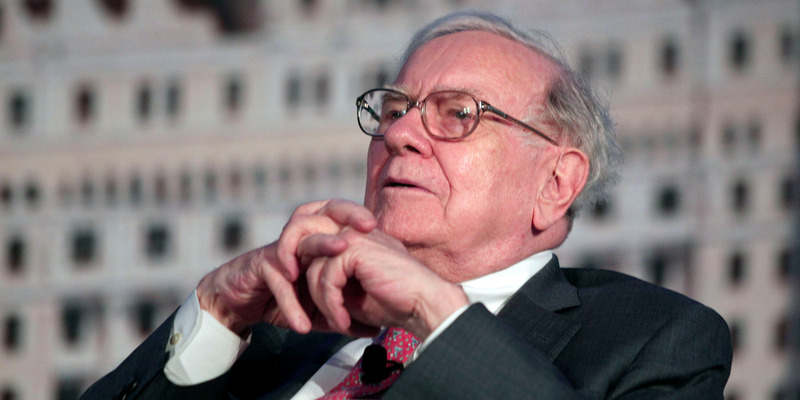 "Warren Buffett is still having difficulty in finding value in US — and perhaps global — stocks." 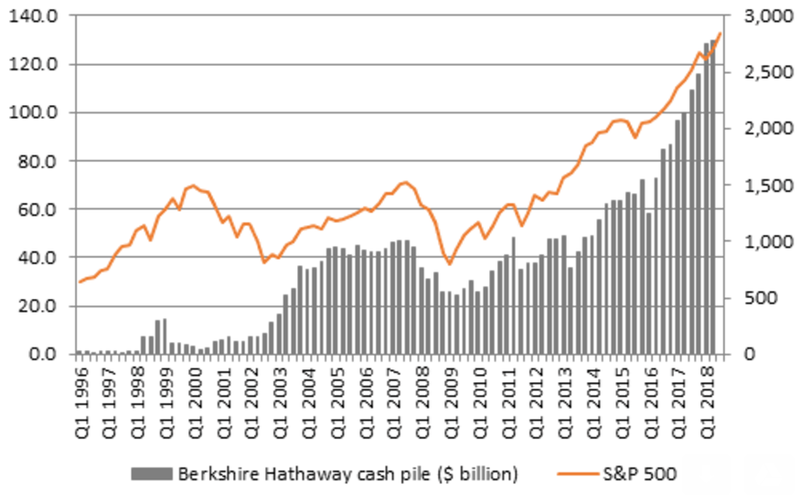 Mould points out — and indicates in the chart above — that Berkshire Hathaway's cash balance has been an effective proxy for market levels over history. As you can see, Buffett held comparatively high levels of cash in the periods preceding the last two market crashes, in 1999 and 2007. So the question for investors now becomes whether to follow Buffett to the sideline, or stay invested in a market that is, by many measures, overextended. After all, the longer they wait, the higher the likelihood they'll be left holding the bag when things go south. Stan Kroenke, who owns 67% of Arsenal FC, has made an offer to buy the remainder of the club. The deal values Arsenal, one of Britain's top soccer clubs, at £1.8 billion ($2.33 billion). 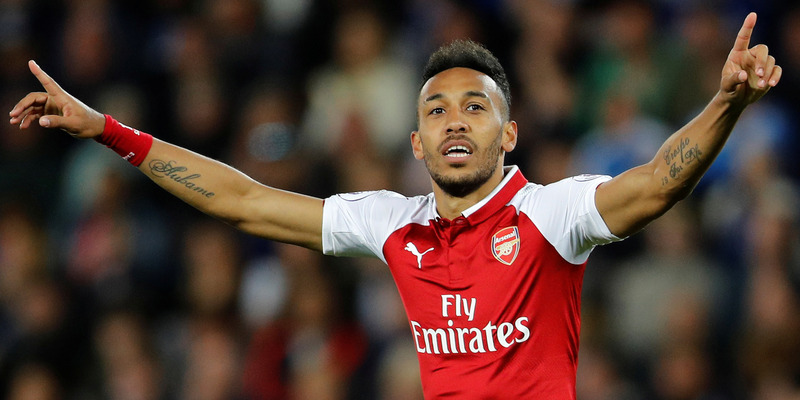 Arsenal's second-biggest shareholder, Russian billionaire Alisher Usmanov, has reportedly agreed to the deal, meaning the takeover should go through easily. The Arsenal Supports Trust are concerned that taking the club private will "neuter [fans'] voice and involvement." LONDON — Arsenal shareholder Stan Kroenke is set to take full control of the North London football club as part of a deal valuing the team at £1.8 billion. 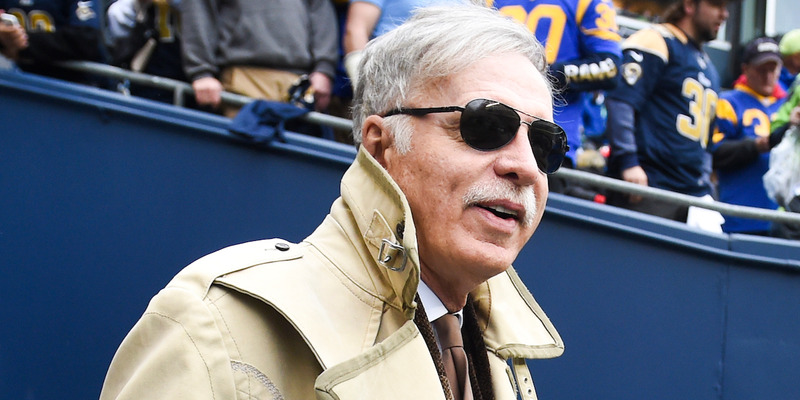 Kroenke currently owns just over 67% of Arsenal FC and on Tuesday KSE, his Delaware-based holding company, announced an all-cash offer to buy all the shares in the club it doesn't already own. The company is offering £29,419.64 ($38,116.50) in cash for each share, valuing the entire club at £1.8 billion. KSE said it has received "irrevocable undertaking" to buy out Arsenal's second-biggest investor, Russian-Uzbek billionaire Alisher Usmanov. Usmanov owns just over 30% of the club through his vehicle Red and White Holdings. Kroenke has been battling Usmanov for control of Arsenal for over a year. Usmanov made a £1 billion ($1.3 billion) bid to buy the American businessman's stake in the club in May 2017, an offer that was rejected. Usmanov's large ownership stake means that if he agrees to the terms set out on Tuesday, Kroenke's takeover bid becomes binding and he can force non-compliant shareholders to sell up. KSE said in its offer that the takeover will "result in the opening of a new chapter in the history of the Club" and said that: "KSE believes moving to private ownership will bring the benefits of a single owner better able to move quickly in furtherance of the Club's strategy and ambitions. KSE is a committed, long-term owner of the Club." Kroenke said in a statement: "We at KSE are moving forward with this Offer leading to 100% ownership of the Club. We appreciate Mr Usmanov's dedication to the Arsenal Football Club and the storied ethos and history the Club represents." The Arsenal Supports Trust, which represents over 1,000 fans of the club, said in a statement on Tuesday morning that the deal "will see the end of supporters owning shares in Arsenal and their role upholding custodianship values." "The most dreadful part of this announcement is the news that Kroenke plans to forcibly purchase the shares held by Arsenal fans," the Trust said. "Many of these fans are AST members and hold their shares not for value but as custodians who care for the future of the club. Kroenke's actions will neuter their voice and involvement. It is in effect legalised theft to remove shareholder scrutiny on how Arsenal is managed." Kroenke, who is worth an estimated $8.3 billion according to Forbes, made money in real estate before becoming a sports mogul in the US. He owns NFL team the Los Angeles Rams and NBA team the Denver Nuggets, among others. He began building his stake in Arsenal in 2007 after buying a 9.9% holding from ITV. Arsenal last year parted ways with Arsene Wenger, who had managed the club for over 20 years after they finished the season 6th in the Permier League, their worst position since 1992. Unai Emery, the former manager of Paris Saint-Germain, was appointed in his place. Deutsche Bank is advising KSE on the takeover deal. 1. Oil prices rose more than 1.5% on Monday ahead of US economic sanctions against that are Iran set to take effect on Tuesday. An initial round of sanctions against Tehran was reimposed Monday, administration officials said, as has been expected since President Donald Trump withdrew the US from the Iran nuclear deal in May. 2. US stocks rose Monday, with the S&P 500 approaching its January all-time high, after a wave of strong earnings reports from companies including Tyson Foods. The dollar edged higher, and Treasury yields fell. 3. Europe’s biggest bank, HSBC, has reached a $765 million (£591 million) settlement with the US Department of Justice to end an investigation into the sale of mortgage-backed securities in the run-up to the 2008 financial crisis, The Guardian reported. The provisional settlement over the way HSBC packaged up toxic bonds between 2005 and 2007 is smaller than some of the settlements the DoJ has reached with other banks, such as the $4.9 billion penalty for Royal Bank of Scotland and the $2 billion settlement with Barclays. 4. Indra Nooyi, PepsiCo's first female CEO, will step down in October after 12 years at the helm. The company announced Monday that its president, Ramon Laguarta, would be the new chief executive. 5. Asian stocks wobbled on Tuesday as simmering worries over the US-China trade conflict offset positive leads from earnings-led gains on Wall Street. MSCI's broadest index of Asia-Pacific shares outside Japan was up 0.05%. 6. New York on Monday filed a lawsuit seeking to compel the Trump administration to turn over more information about a pilot program allowing employers to resolve violations of federal overtime and minimum wage laws without penalties. According to the lawsuit, filed against the U.S. Department of Labor by New York Attorney General Barbara Underwood in Manhattan federal court, the department had failed to respond to a request for more information submitted in April under the federal freedom of information law. 7. Marriott International on Monday signalled weakness in revenue per available room in North America, its largest market, for the third quarter, sending shares of the world's largest hotel chain down about 4%. The company expects revPAR, an important metric that measures a hotel chain's health, to increase by 1.5% to 2% in the region due to Independence Day holiday falling in the middle of the week and tough comparisons to last year's numbers that included the impact of hurricane relief efforts. 8. Turkey’s lira sank to a record low and bonds tumbled as heightened concern over a diplomatic spat with the US overshadowed the central bank’s attempt to support the currency, Bloomberg reported. The lira slumped as much as 6.3% Monday before rising 1.1% Tuesday after a report Turkish officials will head to the U.S.
9. Eleven US passengers who survived an Aeromexico crash in the northern Mexican state of Durango on July 31 filed lawsuits against the airline in Chicago on Monday. The Mexico City-bound Embraer 190 passenger jet smashed into scrubland near the runway shortly after take-off during what passengers have described as strong winds, hail and rain. 10. Bids by telecommunications firms AT&T and Telefonica won 120 MHz of radioelectric spectrum in the 2500-2690 MHz frequency band that can be used for wireless services, Mexico's telecommunications regulator, IFT, said on Monday. The auction had drawn strong interest from operators because it is well-suited for broadband, 5g mobile networks and the so-called Internet of Things. CoinDesk talks to Wall Street analysts ahead of a decision that could find regulators approving the first exchange-traded fund for cryptocurrency. Bitcoin derivatives trading provider LedgerX says it saw a "record" amount of trading volume over the last two months.